An area of user interface design that has not yet been covered in this book relates to the concept of menus within an Android application. Menus provide a mechanism for offering additional choices to the user beyond the view components that are present in the user interface layout. 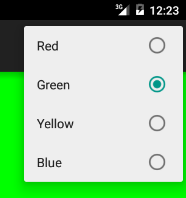 Whilst there are a number of different menu systems available to the Android application developer, this chapter will focus on the more commonly used Overflow menu. When a menu group is configured to be checkable, a small circle appears next to the item in the menu as illustrated in Figure 27-4. It is important to be aware that the setting and unsetting of this indicator does not take place automatically. It is, therefore, the responsibility of the application to check and uncheck the menu item. On the form factors screen, enable the Phone and Tablet option and set the minimum SDK setting to API 8: Android 2.2 (Froyo). Continue to proceed through the screens, requesting the creation of a blank activity named MenuExampleActivity with corresponding layout and menu resource files named activity_menu_example and menu_menu_example. When the project has been created, navigate to the app -> res -> layout folder in the Project tool window and double click on the activity_menu_example.xml file to load it into the Android Studio Designer tool. Switch the tool to Design mode, double click on the background of the layout (the area representing the RelativeLayout view) and enter layoutView into the id field of the popup panel. On earlier versions of Android, the overflow menu is accessible from the soft key toolbar at the bottom of the screen. On Android 4.0 and later, the menu is accessed from the far right of the actions toolbar at the top of the display. This menu provides a location for applications to provide additional options to the user.